Despite facing one of the most oppressive atmospheres in its history, thousands of Turkish protesters took to the streets of Istanbul on November 20 against a crackdown on Turkey’s main pro-Kurdish party, its lawmakers and mayors in the country’s south-east, as well as on opposition media outlets following the July coup. “We will resist and resist until we win!” chants Sebahat Tuncel before her mouth is forcibly shut by half a dozen police officers who drag her along the floor and detain her in early November. The political situation in Turkey continues to deteriorate in the wake of the attempted coup d’état in July, allegedly organised by the Gülen Movement, a former ally of the ruling Justice and Development Party (AKP). It has in fact led to a slow incremental counter-coup where President Recep Tayyip Erdoğan and his cronies have progressively jailed, marginalised and silenced opponents of all hues — but especially the Kurdish movement. Peoples' Democratic Party (HDP) Kars deputy and party spokesperson Ayhan Bilgen said 441 HDP members have been detained since the arrest and imprisonment of 10 HDP MPs on November 4. Speaking to the press in Ankara on November 10, Bilgen said there had been a systematic crackdown on HDP members and those protesting the imprisonment of the left-wing pro-autonomy HDP's MPs, including co-chairs Selahattin Demirtaş and Figen Yüksekdağ. On November 4, Turkish authorities issued arrest warrants for all 59 MPs of the Kurdish-based left-wing opposition Peoples Democratic Party (HDP). The party’s leaders, Selahattin Demirtaş and Figen Yüksekdağ, and several other MPs were taken into detention. The regime of Turkish President Recep Tayyip Erdoğan took a further leap towards undisguised dictatorship, intensifying its crackdown against the democratic and left-wing opposition, independent media and the Kurdish population. On October 25, Co-Mayors of the Diyarbakır (Amed) Metropolitan Municipality, Gültan Kışanak and Fırat Anlı, members of the Kurdish Democratic Regions Party (DBP), were arrested. Free Women’s Congress (KJA) spokesperson Ayla Akat Ata was detained at a protest calling for Kışanak and Anlı's release and is now facing terrorism charges alongside them. Aftermath of ISIS attack on HDP members' wedding. Gaziantep, August 20. 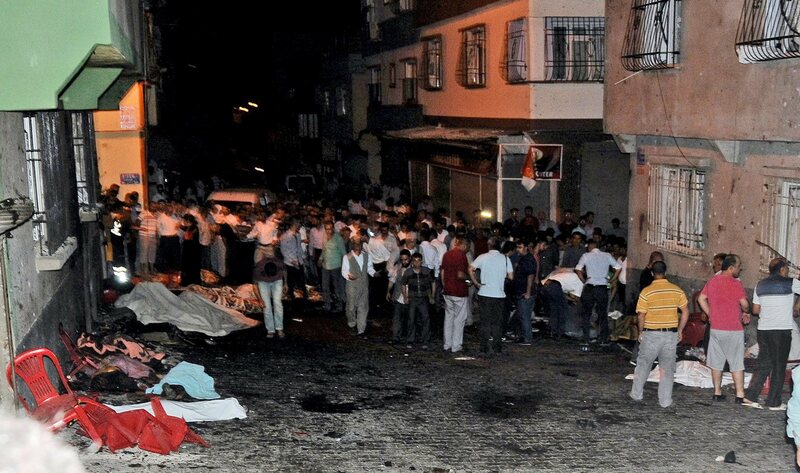 The bombing of the wedding of two members of the opposition Peoples Democratic Party (HDP) in the southern city of Gaziantep on August 20 killed 54 people, including 29 children. ISIS appears to be responsible, although like other attacks by ISIS in Turkey over the past year and a half, the targets have been opponents of the Turkish government of Recep Tayyip Erdoğan. HDP MPs hold copies of Özgür Gündem in parliament, August 17.